Summary: Cognitive function can be quantified and linked to how well a child performs in a game of soccer, researchers report. 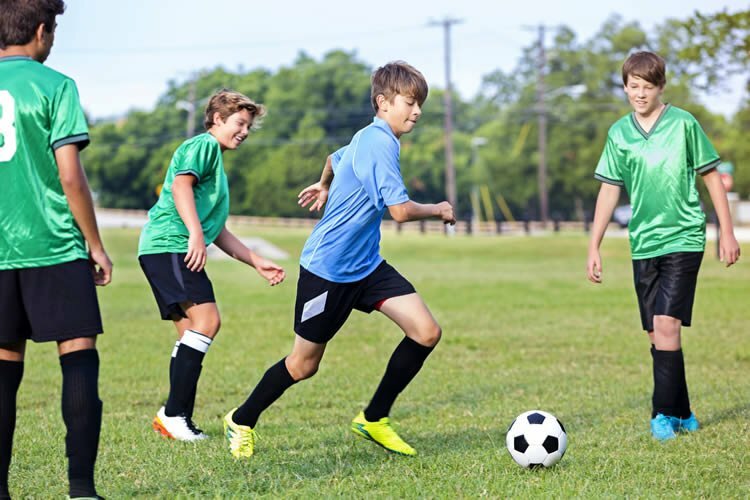 The working memory and other cognitive functions in children and young people can be associated with how successful they are on the football pitch, a new study from Karolinska Institutet, Sweden, shows. Football clubs that focus too much on physical attributes therefore risk overlooking future stars. Physical attributes such as size, fitness and strength in combination with ball control have long been considered critical factors in the hunt for new football talent. The third, slightly elusive factor of “game intelligence” — to always be at the rights place at the right time — has been difficult to measure. In 2012, researchers at Karolinska Institutet provided a possible scientific explanation for the phenomenon, and showed that the so-termed “executive cognitive functions” in adult players could be associated with their success on the pitch. In a new study, which is published in the scientific journal PLOS ONE, they show that cognitive faculties can be similarly quantified and linked to how well children and young people do in the game. Executive functions are special control functions in the brain that allow us to adapt to an environment in a perpetual state of change. They include creative thinking in order to quickly switch strategy, find new, effective solutions and repress erroneous impulses. The functions are dependent on the brain’s frontal lobes, which continue to develop until the age of 25. Executive functions are special control functions in the brain that allow us to adapt to an environment in a perpetual state of change. They include creative thinking in order to quickly switch strategy, find new, effective solutions and repress erroneous impulses. The functions are dependent on the brain’s frontal lobes, which continue to develop until the age of 25. NeuroscienceNews.com image is adapted from Karolinska Institute press release. For this present study, the researchers measured certain executive functions in 30 elite footballers aged between 12 and 19, and then cross-referenced the results with the number of goals they scored during two years. The metrics were taken in part using the same standardised tests used in healthcare. Strong results for several executive functions were found to be associated with success on the pitch, even after controlling for other factors that could conceivably affect performance. The clearest link was seen for simpler forms of executive function, such as working memory, which develops relatively early in life. “This was expected since cognitive function is less developed in young people than it is in adults, which is probably reflected in how young people play, with fewer passes that lead to goals,” says Predrag Petrovic. The young elite players also performed significantly better than the average population in the same age group on several tests of executive function. Whether these faculties are inherited or can be trained remains the object of future research, as does the importance of the different executive functions for the various positions on the field. Funding: The study was funded by PRIMA Barn- och Vuxenpsykiatri AB and Karolinska Institutet in Sweden. First author is Torbjörn Vestberg, graduate student at Karolinska Institutet’s Department of Clinical Neuroscience. Image Source: NeuroscienceNews.com image is adapted from Karolinska Institute press release. Karolinska Institute “Soccer Success in the Young Can Be Measured in the Brain.” NeuroscienceNews. NeuroscienceNews, 9 February 2017. Karolinska Institute “Soccer Success in the Young Can Be Measured in the Brain.” http://neurosciencenews.com/football-neuroimaging-youth-6093/ (accessed February 9, 2017). Physical capacity and coordination cannot alone predict success in team sports such as soccer. Instead, more focus has been directed towards the importance of cognitive abilities, and it has been suggested that executive functions (EF) are fundamentally important for success in soccer. However, executive functions are going through a steep development from adolescence to adulthood. Moreover, more complex EF involving manipulation of information (higher level EF) develop later than simple executive functions such as those linked to simple working memory capacity (Core EF). The link between EF and success in young soccer players is therefore not obvious. In the present study we investigated whether EF are associated with success in soccer in young elite soccer players. We performed tests measuring core EF (a demanding working memory task involving a variable n-back task; dWM) and higher level EF (Design Fluency test; DF). Color-Word Interference Test and Trail Making Test were performed on an exploratory level as they contain a linguistic element. The lower level EF test (dWM) was taken from CogStateSport computerized concussion testing and the higher level EF test (DF) was from Delis-Kaplan Executive Function System test battery (D-KEFS). In a group of young elite soccer players (n = 30; aged 12–19 years) we show that they perform better than the norm in both the dWM (+0.49 SD) and DF (+0.86 SD). Moreover, we could show that both dWM and DF correlate with the number of goals the players perform during the season. The effect was more prominent for dWM (r = 0.437) than for DF (r = 0.349), but strongest for a combined measurement (r = 0.550). The effect was still present when we controlled for intelligence, length and age in a partial correlation analysis. Thus, our study suggests that both core and higher level EF may predict success in soccer also in young players.